A Giant Thank You to Everyone that Supported the Uptown Music Collective during our 2018 – 2019 Performance Season. We would not be able to do what we do without supporters like you! We have two performances left! 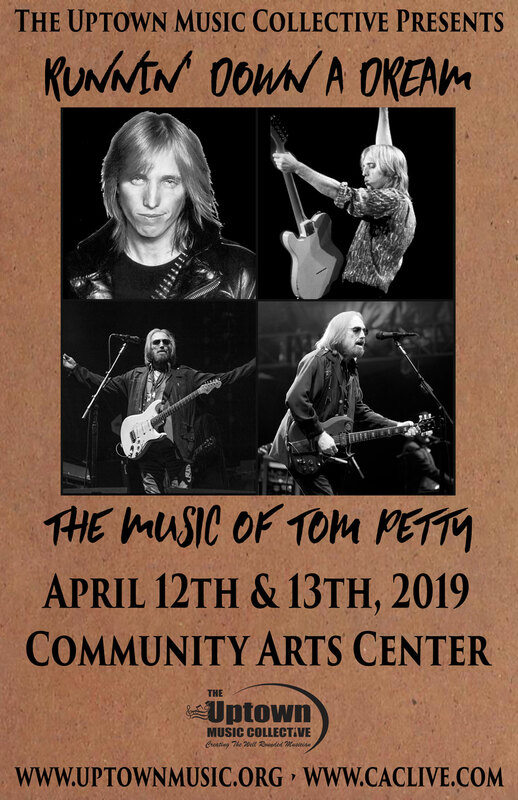 Our Runnin’ Down A Dream: The Music of Tom Petty Encore Performance will be April 26th & 27th at 7 PM the Millbrook Playhouse in Mill Hall, PA. This special Encore Performance is a fundraiser for the Mill Brook Playhouse! Check back for updates for next year’s 2019 – 2020 Performance Season! 2019 – 2020 Performance Season! The Collective is in the process of seeking sponsorship’s for next year’s performance season from businesses, organizations, or individuals in the community. Sponsorship dollars underwrite the cost of UMC performances; including theater rental, stage build outs, in-house technical and stage crew labor, costumes, equipment costs, and more. 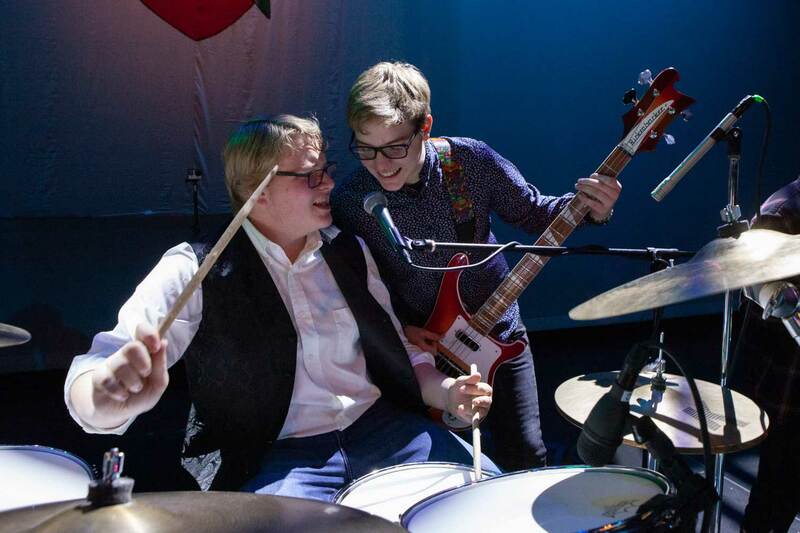 Allowing the show’s ticket sales to go directly to help fund the programs that teach these 10-18-year-old students the musical skills, confidence, and showmanship so clearly displayed on stage. To Become A Sponsor – CLICK HERE for more information! If you have any interest in becoming a performance season sponsor, please contact the Uptown Music Collective by emailing jared@uptownmusic.org or calling 570-329-0888. Another year has arrived at the Uptown Music Collective and with that another exciting performance season on the horizon. Over the years, the school’s performance program has become the public face of the non-profit school of music. Clearly demonstrating the success of its high-quality music education programs, by providing the community professional level entertainment at an affordable ticket price. The school and its students, who continue to excel generation after generation, pride themselves on making each performance season better than the last and this year is no exception. 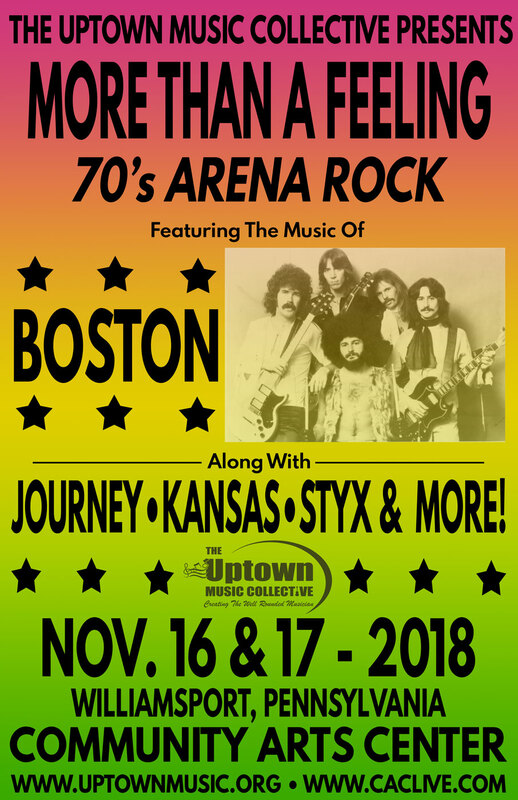 The 1970’s are considered by most to be the original classic rock era, and few bands capture the magic of that time period better than bands like Boston, Journey, Foreigner, Kansas, and Styx. 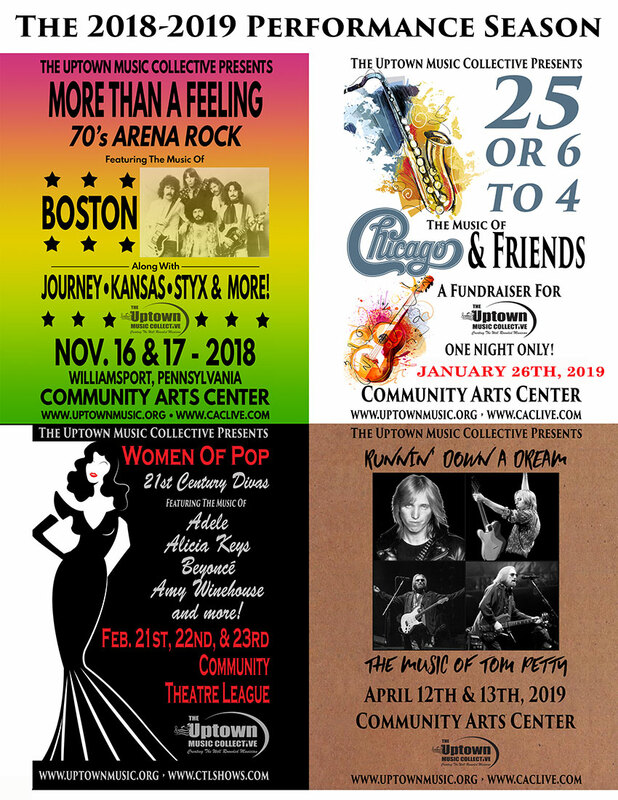 With More Than a Feeling, the Uptown Music Collective will pay tribute to the kings of arena rock, featuring all of the hits from these groundbreaking bands, including Foreplay/Longtime, Don’t Stop Believing, Cold as Ice, Carry On Wayward Son, Come Sail Away and many more! The powerful blend of loud guitars and powerful brass instruments has fueled some of rocks best music. 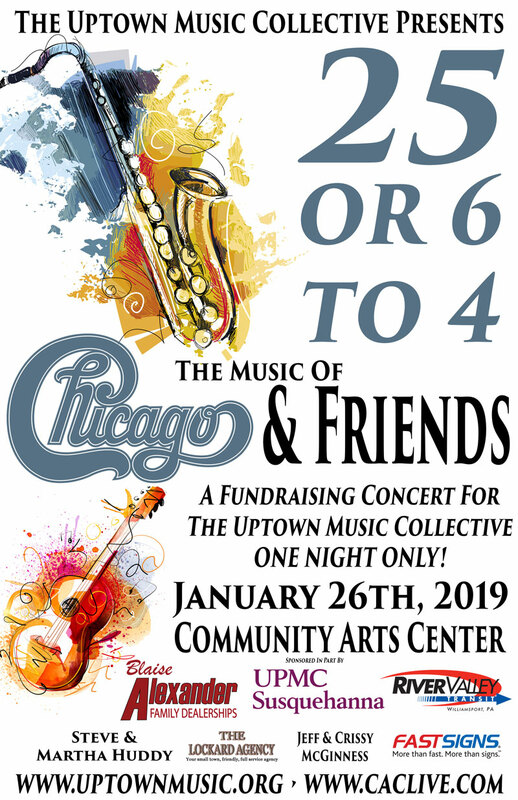 In 25 Or 6 To 4, the students of the Uptown Music Collective will harness this traditional rock sound to bring to the stage the music of legendary bands Chicago, and Blood Sweat and Tears. Along with the funky music of Earth Wind and Fire, Tower of Power, and a special, soul-stirring tribute to the Queen of Soul, Aretha Franklin. This will be the Collective’s annual fundraiser show which raises funds for Scholarships and Program Support for the nonprofit school of music. Additionally, this concert will feature special guest performers including UMC Alumni and Instructors. This is a night not to be missed! Women are the fabric on which 21st Century Pop Music is being written. Modern Divas like Adele, Alicia Keys, Kelly Clarkson, Beyonce and more are pumping out hit song after hit song, forever changing the landscape of modern music. 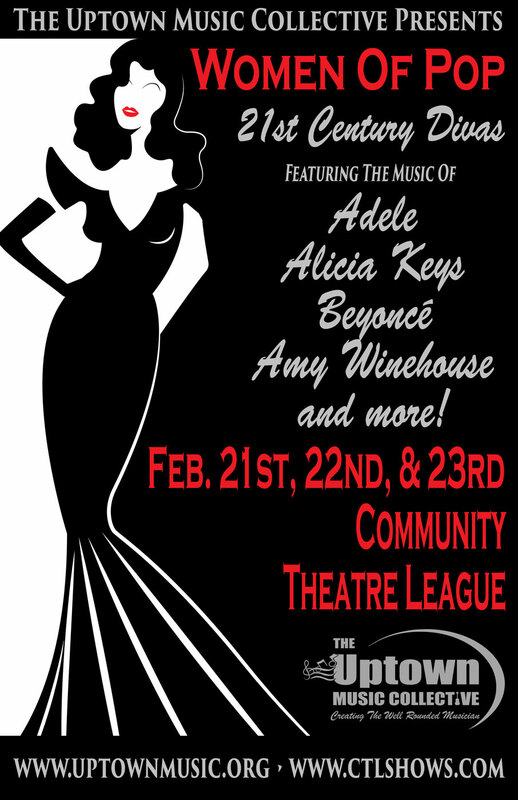 In this intimate and exhilarating performance, the Uptown Music Collective will unleash its powerful group of female vocalists in a tribute to some of today’s most successful singers.